If you have been following this blog for a while, chances are you know I get excited about giving gifts. It is up there on my list of favorite things (along with baking and throwing parties). These are a few of my favorite foodie gifts for this Christmas. Homemade Vanilla Extract – I am a huge fan of homemade gifts…especially vanilla. Once you use it, I promise you will be hooked. Gingerbread Chocolate from Askinosie Chocolate – Love this gift because not only is the packaging creative, it supports a local business and gives back internationally! Seven Daughter’s Moscato – Seriously the cutest bottle of wine I have ever purchased. Love the branding and packaging for this Moscato! I picked this bottle up at Hyvee. I’m pretty sure the recipients of these gifts are going to be pretty excited too! I’ve spent a great deal of time in the kitchen over the past week…and it has been wonderful. Every year, I have my Christmas favorites, but I love to add new recipes to the mix as well. This year I wanted to add a salted caramel recipe. I found a great recipe from Cooking Classy and made some adaptions to make these Salted Caramel Pretzel Thumbprint Cookies. Perhaps not the shortest name for a cookie…but I promise they are super delicious! Preheat oven to 350 degrees. In a mixing bowl, whisk together flour, cocoa powder and salt, set aside. In the bowl of an electric stand mixer fitted with the paddle attachment, whip butter, granulated sugar and brown sugar on medium-high spread until slightly pale and fluffy, about 2 minutes. Mix in egg yolk (set egg white aside in a bowl in refrigerator) and vanilla extract. Blend in buttermilk. With mixer set on low speed, slowly add in dry ingredients and mix just until combined. Shape dough into a ball and drop onto a sheet of plastic wrap, flatten dough into a 6-inch disk then wrap with plastic wrap and chill 45 minutes, until slightly firm. Place finely chopped pretzels in a bowl. Shape dough into 1-inch balls then working with one at a time, firmly roll dough into chopped pretzels. Transfer to parchment paper lined baking sheets and make a deep indentation with thumb in the center of each dough ball. Bake in preheated oven until set, about 10 – 12 minutes. Remove from oven then using the bottom of a rounded teaspoon, gently press down on existing indentation (to create more space for caramel). Cool on baking sheet several minutes then transfer to a wire rack to cool completely. Place caramels and cream in a microwave safe bowl. Heat mixture in microwave on HIGH power in 30 second intervals, stirring after each interval until melted and smooth. Spoon caramel into indentation in cookies and sprinkle tops with a small pinch of sea salt. Place chocolate and oil into a separate microwave safe mixing bowl. Heat mixture on 50% power in 30 second intervals, stirring after each interval until melted and smooth. Pour into a piping bag or ziplog bag and cut tip of corner. Drizzle over cookies. Allow to set then store in an airtight container. I can’t believe Thanksgiving is next week! So much baking to be done, and so many new recipes to try for the holidays! 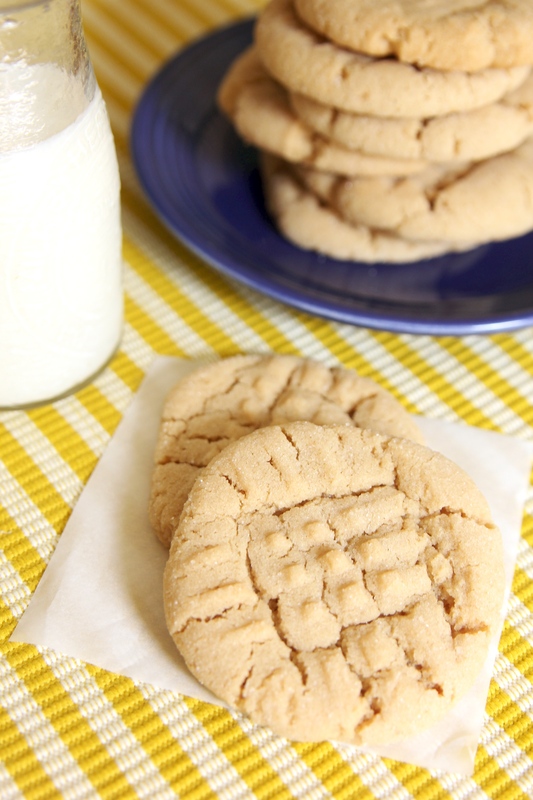 There are several classics that are so great this time of year too…like peanut butter cookies. They make a great addition to any cookie tray or as a cutely packaged and delicious gift! Using a mixer, cream together butter and both sugars together on medium speed until smooth. Add eggs and mix until combined, about 1 minute. Scrape down the sides and bottom of the bowl as needed. Add the vanilla and peanut butter and mix on high until combined. Set aside. In a separate bowl, combine flour, baking soda, baking powder, and salt. Add to the wet ingredients and mix on low until combined. Dough will be thick, yet very sticky. Cover dough tightly and chill for at least 2hours in the refrigerator. Roll balls of dough (about 1.5 tablespoons of dough per cookie) and roll into granulated sugar. Place cookies 2 inches apart on the baking sheets. Press fork into the tops to create the criss-cross pattern. Bake for 10 minutes or until very lightly browned on the sides. Remove from the oven and let cool on baking sheet for 5 minutes before transferring to a wire rack to cool completely. It is National Dessert Day! I hope you are celebrating with some amazing dessert! I thought I would celebrate with a blog post on a timeless recipe, Cheesecake. 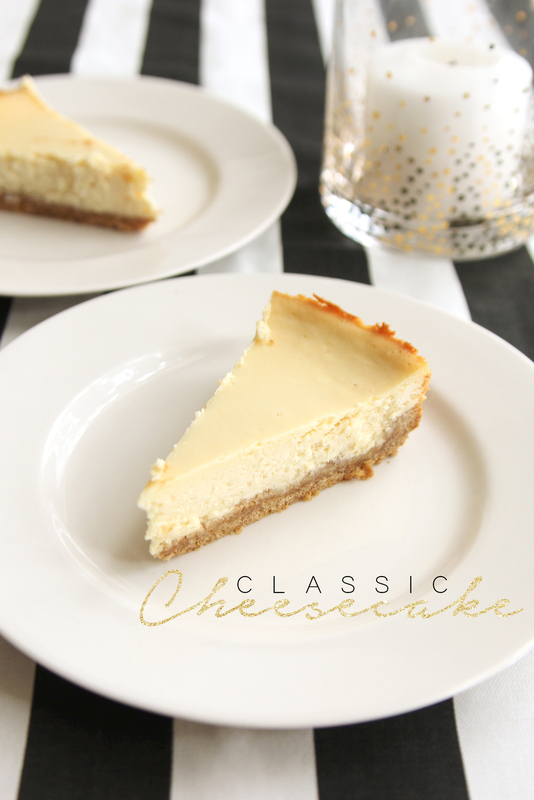 Cheesecake is one of my favorite desserts and I have been making variations of this recipe since I was in high school, however this is the first time I went with the classic base. I will say I have no regrets about that decision what-so-ever. 3 (8oz) packages of cream cheese, softened. Preheat oven to 300 F. Combine graham cracker crumbs, sugar and melted butter in a small bowl. Press into a springform pan and set aside. Beat cream cheese on medium speed until whipped, slowly stir in sweetened condensed milk, eggs and vanilla until smooth. Pour over prepared crust. Cover pan with foil and bake in preheated oven for 30 minutes, remove foil and bake for another 30 minutes until set. Cool at room temperature then refrigerate overnight. A few tips: You can choose to leave the foil step out, but it helps the cheesecake from getting too brown. I prefer to cool my cheesecake in the oven for a bit with the door open, this allows the cheesecake to come up to room temperature and helps prevents cracking. I also think cheesecake is best the second day, after the flavors have had time to sit and chill…but let’s be honest, I’ll be happy to eat it any time. It has been almost eight months since I last posted. So much life has happened in the past few seasons. Spring and summer were filled with so many hard things. So many big things. But just as the weather turned a little cooler…this new season has brought some really good things. New things for my little family of three; and I couldn’t be more grateful for fall. 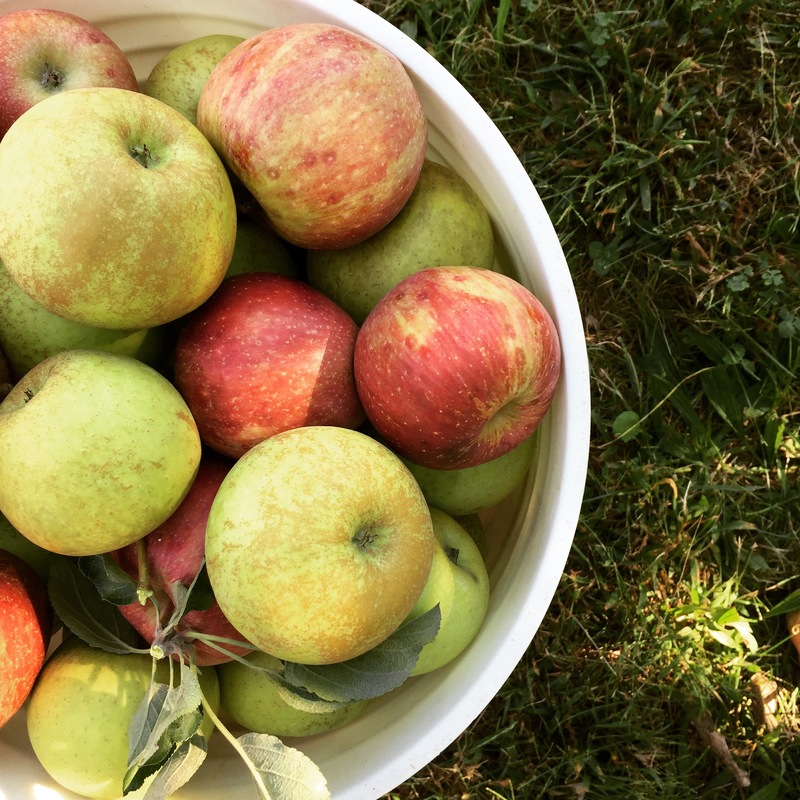 Last Friday Ean, Nora and I went and picked apples at an orchard near by. It didn’t take long to fill up the five gallon bucket, but the kids had a blast, and loved being tall enough to reach the apples. Nora requested to make apple pie at least six times, and I can’t wait to make one with her in the next few days. 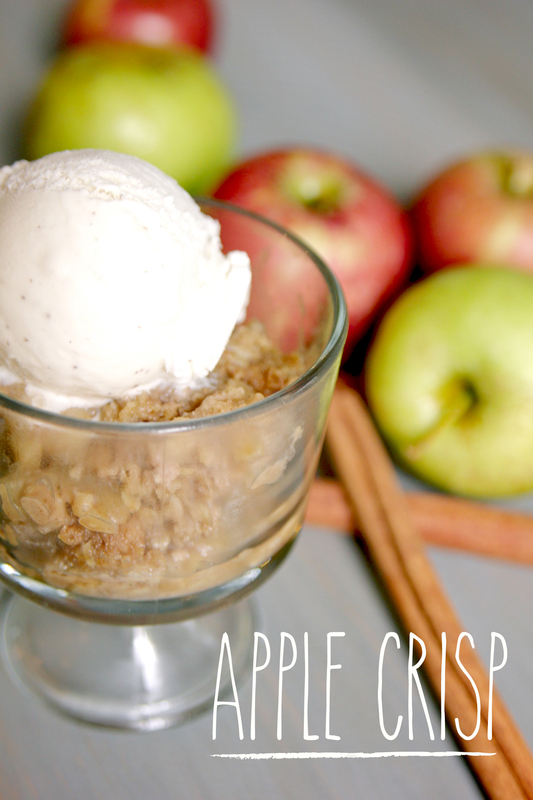 The first recipe we made with our freshly picked apples was apple crisp, so I thought I would get back to blogging. It is incredibly easy to make and has all of the flavors of fall. Core, peel & slice apples. In a large bowl, mix together apples, sugar, cinnamon, flour and salt and spread into an 13×9 pan. In a medium bowl, mix together baking soda, baking powder, oatmeal, flour, brown sugar, and cinnamon. Cut in butter until crumbly. Layer on top of apples. Bake at 325 degrees F for 45 minutes or until top starts to brown and apples are tender. Serve warm with whipped cream or vanilla bean ice cream. Enjoy! 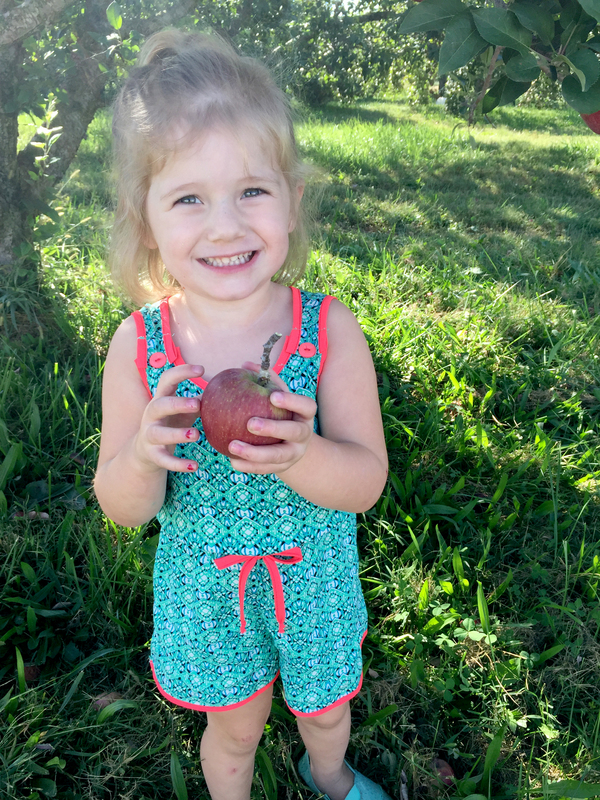 A couple photos from our apple pickin’ adventure. I can not believe how big Miss Nora is! Hope your Valentine’s Day is a sweet one! 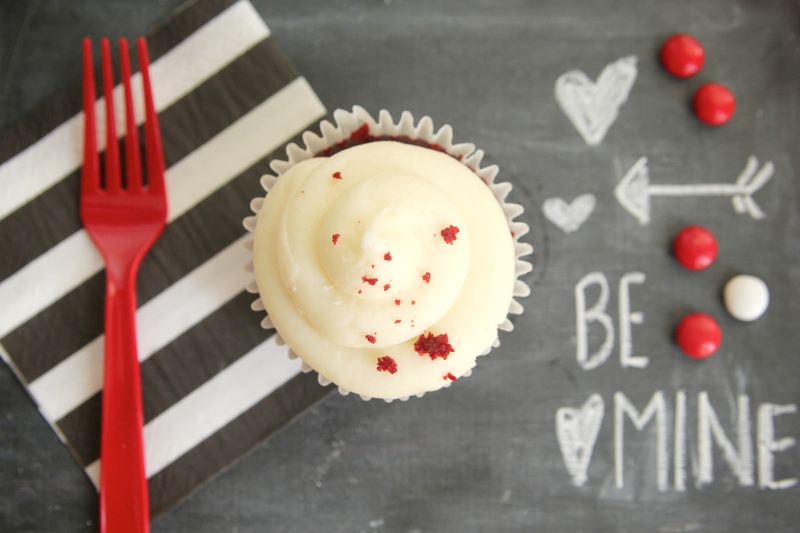 Valentine’s Day provides the perfect opportunity to make red velvet treats…if you feel like you need a reason. I’m happy to eat red velvet 365 days a year. 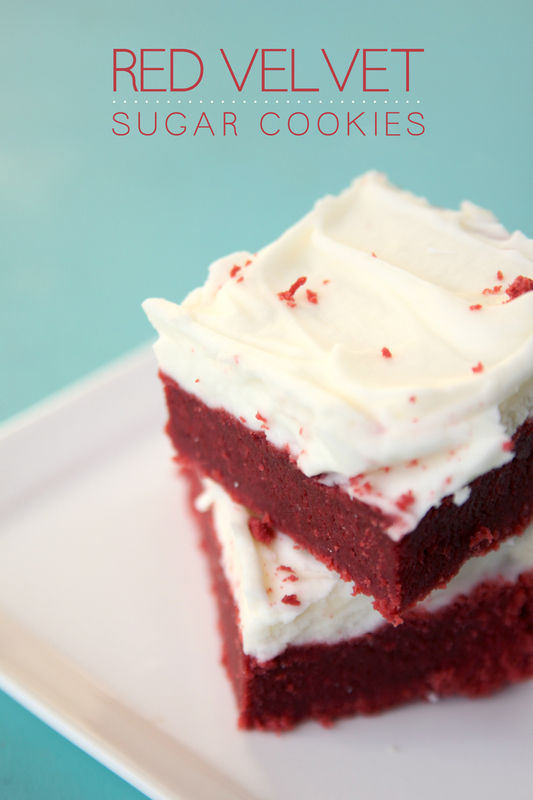 These Red Velvet Sugar Cookie Bars are a great variation on the flavor! Preheat oven to 350 degrees. Have a 9×13 inch pan ready. Line the pan aluminum foil and spray with cooking spray so that the bars easily lift out and are easy to cut. In a medium bowl, whisk together flour, cocoa, salt, and baking powder. Set aside. In a mixing bowl, cream together 1 cup butter softened and sugar until light and creamy. About 2-3 minutes. Beat in the eggs, vanilla, and food coloring until combined. Add the flour mixture until a soft dough forms. Press into the bottom of the 9×13 inch pan. Bake for about 20 minutes until the edges start to pull away from the sides and a toothpick entered into the center comes out clean. Allow to completely cool before frosting. To make the cream cheese frosting, Beat together the cream cheese and butter. Add the powdered sugar and vanilla. Beat together until smooth. Frost the top of the bars and enjoy! You can use sanding sugar or a few cookie crumbs to garnish.